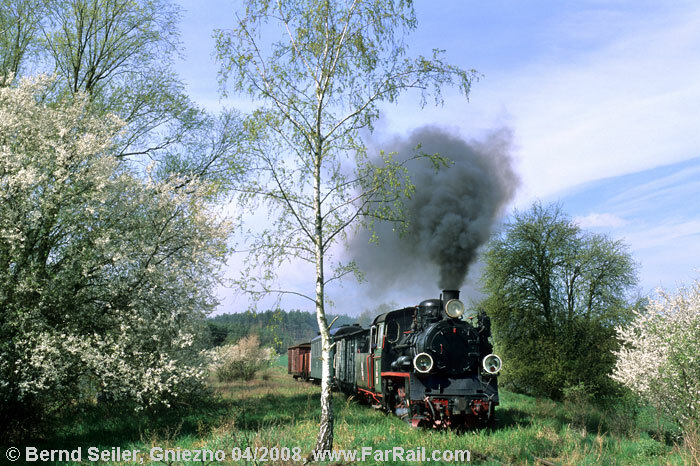 After more than a year without a visit to the Polish narrow gauge lines, it’s time for another one  a tour back in time when small branch lines were still steam operated. 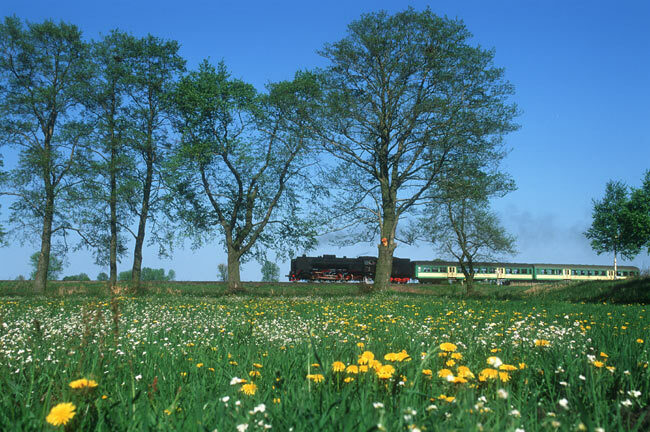 We chose the month of April because the tracks are still not overgrown and hence visible, we are coming shortly before the normal tourist season starts and we have a good chance to find trees in blossom along the line and meadows yellow with dandelions. 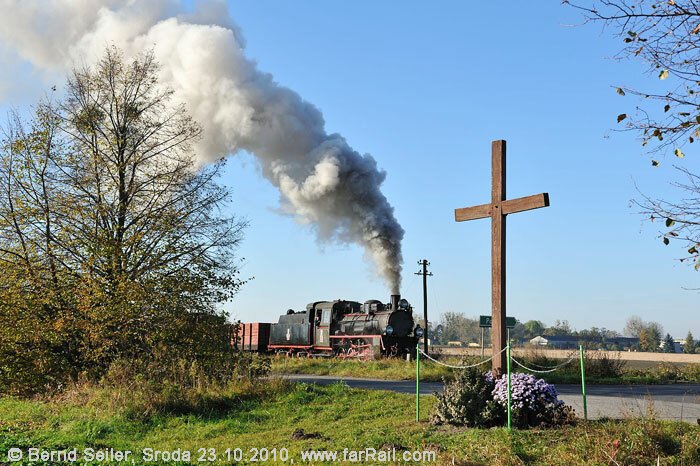 For our tour we’ve chosen four trusted narrow gauge lines in the north western part of Poland: Sroda, Gniezno, Znin (now with Px38 805 in black!) and Nowy Dwor. Of course, the focus lies on authentic trains which could have been seen some 20 to 35 years ago on Polish narrow gauge lines. As far as possible we’ll replace the names of the new owners with the original PKP (Polish State Railway) lettering. As usual we’ll use the beautiful early morning light to be rewarded with steam exhaust from the morning chill and we’re also planning some night shots. Sunrise in Poznan is at 05.33, sunset at 20.09 hrs (April 25th). 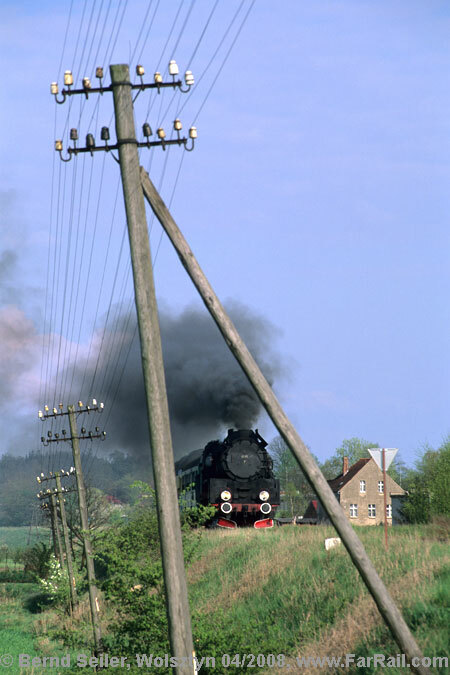 Wolsztyn (Wollstein) offers the last remaining steam operation of any European state railway. The service is unique in Europe: regular passenger trains, steam hauled and working to a tight schedule on a line which looks very much like 1930 rather than 2012. Only the stations are modernised. The telegraph poles along the line are still in place, and several stations still use semaphores. At the moment, as I’m writing these lines, the steam service is limited to the line Zbaszyn (Bentschen)  Wolsztyn  Leszno (Lissa). This line still has it’s manually operated barriers and old, little stations. 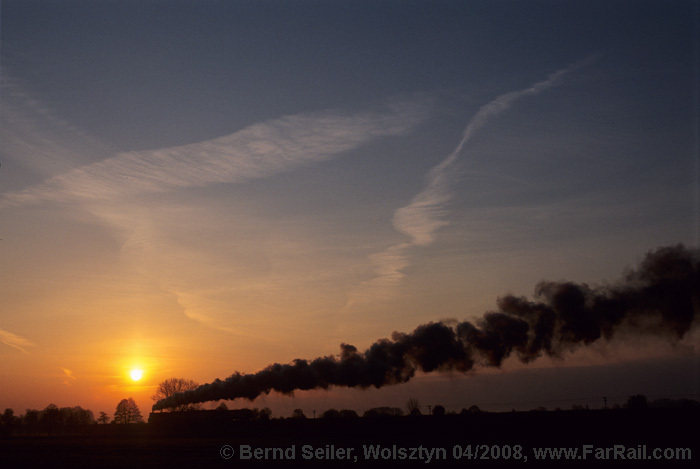 But from December 2011 they want to operate the line to Poznan with steam again. The use of steam is supported by local politicians. However, the service makes an enormous loss. In this time of frequent bail outs and billions in guarantees for struggling economies, it can’t be guaranteed that the steam service will continue and we’ll see the steam locos of Wolsztyn in service. In such an unfortunate event, we can just visit the steam depot at Wolsztyn which is in a class of its own. Individual travel to Sroda in the evening, for instance departure Berlin Hbf ca. 14.40 hrs, arrival Sroda Wlkp. ca.18.30 hrs. Morning charter freight train with the one and only serviceable Px38  back in black  on the 600 mm-line from Gasawa to Znin. Planned schedule: Znin 05.45  06.30 Gasawa 06.40  10.45 Znin, in the afternoon we’ll continue with our charter bus to our hotel near Stegna. Charter bus to Nowy Dwor Gdanski (Tiegenhof). 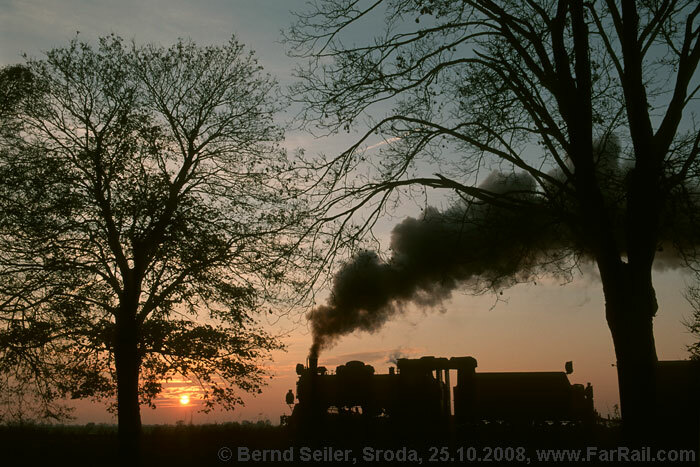 Around 06.00 hrs we’ll board our charter freight train, hauled by a Px48 to Stegna Gdańska (Steegen) and on to Mikoszewo/Prawy Brzeg Wisły (Nickelswalde/Rechtes Weichselufer). From there we’ll return tender first to Stegna Gd. In Stegna we’ll turn the locomotive and continue chimney first back to Nowy Dwor Gdansk, arrival ca. 16.30 hrs. Charter bus to our Hotel near Stegna. By train we’ll return to Berlin. Departure Gdansk Glowny 09.14 hrs, changing trains in Szczecin Glowny (Stettin Hbf) 14.15/14.32 hrs, arrival Berlin Hbf at 16.41 hrs. Wolsztyn is a small Polish town in the former Prussian province of Ostbrandenburg. It is located near Pozńan (Posen) and is about 220 km east of Berlin. 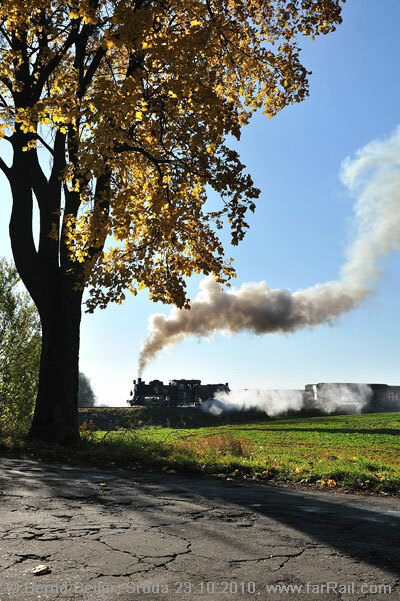 Many railway enthusiasts have heard of Wolsztyn and visit there regularly due to the daily use of steam locomotives on normal trains. Without doubt, the steam experience there is something very special because this is the only area on any European state railway where you can find steam locomotives in everyday use! The use of steam on selected normal services is seen as a service to enthusiasts and it also helps the local economy. The economic position of the railway is dire and it’s amazing that anyone in such an organisation could contemplate operating regular trains with steam. Normally the railway would not provide such a service for enthusiasts. However, there are some politicians who support the survival of Wolsztyn, with British enthusiasts as well as the city councils of both, Wolsztyn and Pozńan supporting and funding the project. During our short visit you should not expect to see more than one locomotive in service. According to the staff situation, available locomotives and political decisions you should expect some difficulties which, sometimes, lead to no steam running at all. This is a regular service and we can’t guarantee anything. The countryside around Wolsztyn is varied; there are lakes, plains, low lying hills, small rivers and so on. The special charm of the area is the small towns and villages that are almost unchanged from the last century. It’s still possible to find farmers with horse drawn vehicles coming from their own small fields. The lines around Wolsztyn feature many interesting station buildings constructed in typical Prussian architectural styles. We’ll find traditional level crossings with small crossing keeper’s houses in half-timbered style. Some of them are still in use after more than 130 years! On the line to Poznan these stations are almost all spoiled by modern supplements which where added during the overhaul of the line, but the Leszno line is still in its traditional shape. In addition, there are several other opportunities for the photographer: embankments, cuttings, curves, bridges (both, brick stone and iron ones) and several bridges over the railway track, mainly built in the 1930s and last, but not least, German style semaphore signals. Passenger trains normally consist of two original green carriages or some of the blue-yellow double deck passenger coaches. The originally meter gauge “Schrodaer Kreisbahn“ had an extension of almost 100 km (without their standard gauge line system, which was operated by the company as well and sold some 80 years ago to the city of Poznan). 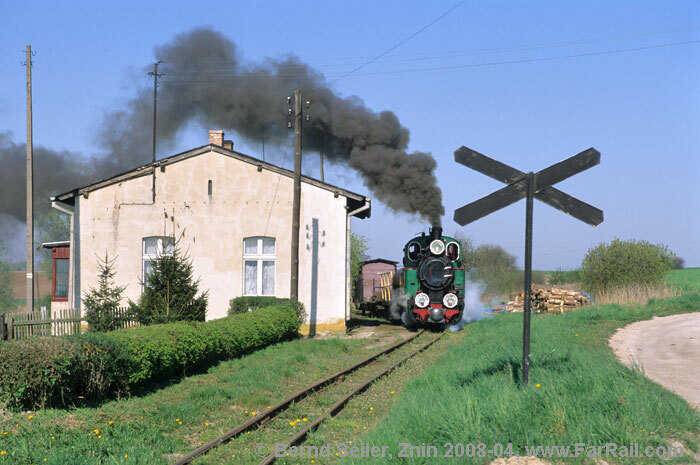 The only surviving narrow gauge part is Sroda  Zaniemysl (Santomischel, during WWII the nazis named it “Schneeschütz“). On this 14 km long section we’ll run two trains, one in the early morning and one in the late afternoon. The morning train will be a narrow gauge freight train, comprising some different wagons including the obligatory brake van, where we’ll put some emergency seats. In the afternoon we’ll have a passenger train with two or three coaches plus guards and luggage van. This was the arrangement in the last days under PKP operation up to 2000. As a point of interest, this was the last genuine steam operation of the Polish State Railway PKP, if you consider Wolsztyn as a museum project with regular trains (which it was at that time already). We’ll replace the current inscription on the passenger coaches with the old PKP lettering to make the train perfect in detail. Unlike the other lines, Sroda still has some freight cars which only need a brief inspection before they can be used again. The line is almost unchanged since the last PKP trains ran on it. Countryside highlights are not available here, so we’ll use the early morning light and the late afternoon light to get some interesting shots. If there is a sunset, we’ll be at the right position to capture it with our train to be in silhouette. 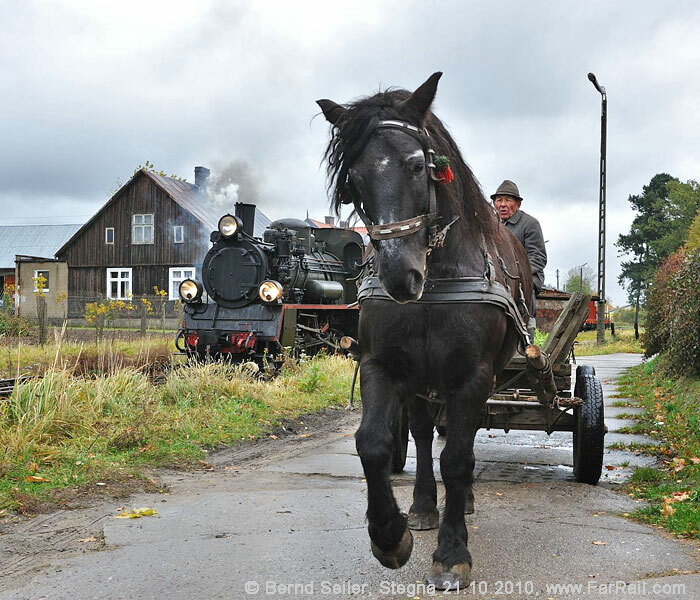 The longest ride on the narrow gauge part of our tour will be the 38 km trip on the Gniezno narrow gauge line from Gniezno Wask. to Anastazewo. The countryside is especially beautiful between Powidz and Anastazewo, where there is a lake next to the railway line. Of course we’ll make several photo stops and runpasts here. Our train will be hauled by an 0-8-0 Px48. The train will be a typical mixed train with (original green) passenger coach, a green guards and luggage van and two freight cars. Because we’ve planned many runpasts along the line the trip will last half a day, so we’ll have a late lunch on this day. We’ll arrange some snacks on the train. Except for seasonal tourist traffic this once large railway network ceased regular operation in the mid 1990’s. The first tourist train ran here as early as in the late 1970’s, so the railway is used to being frequented by tourists. Unfortunately almost all coaches have been rebuilt as colourful tourist coaches which have nothing in common with regular trains. So again, we cannot use them for our train. From the still available freight wagons we have chosen four for our special train. The 0-8-0 Px38 is now painted in black again, as it used to be in its last years of regular use. Of the once 76 km line, there remains only 12 km, from Znin (Znin) to Gasawa (Gonsawa). Our locomotive will be Px38 805. The museum of the railway is in Wenecja. If our time permits we’ll make a brief stop there to visit it. Virtually all locos there are painted green which was the common colour of some of the Polish steam loco fleet. The line passes though a rural countryside, mostly flat but with some hilly parts. Large fields, little lakes, small forests and narrow roads are the surroundings of our line. The first 750 mm track was laid for a sugar factory in 1891. In 1898 the system reached a length of 55 km. The year after the “Westpreußische Kleinbahnen AG” (West Prussian Local Railways Inc.) in Berlin took over the lines and extended the system in the Vistula delta continuously. In 1944 the length of the system exceeded 300 km. The technical highlight of the line through a flat countryside with many small rivers is a 51 metres long pivot bridge near Rybina (Fischerbabke). This swing bridge was delivered by the Steelworks Dortmund AG in 1905 and is still serviceable in 2011! On both sides of the bridge are gradients. Up to 1984 there were steam locomotives (last class: Px48) in use. For light passenger services they always used some unique railcars which were replaced by ordinary Romanian railcars in 1986. Since 1970 the Polish state railway PKP cut parts of the line and abandoned passenger services on other sections. In 1996 the last passenger train ran, followed by the very last freight in 1999. Because this area sees many tourists it was possible to reactivate a part of the line by involving the city councils and a railway enthusiasts club. 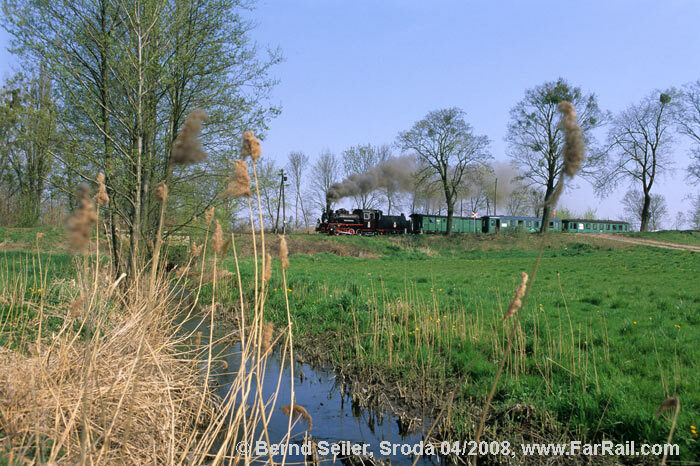 Under the trading name Żuławskiej Kolei Dojazdowej the line has offered seasonal tourist trains since 2003. The lines in use are Nowy Dwór Gdański (Tiegenhof) north west bound to Mikoszewo/Prawy Brzeg Wisły (Nickelswalde/Rechtes Weichselufer) and north east bound to Sztutowo (Stutthof). In 2010 a businessman organised and paid for an overhaul of a Px48 in the workshop at Pila (Schneidemühl). 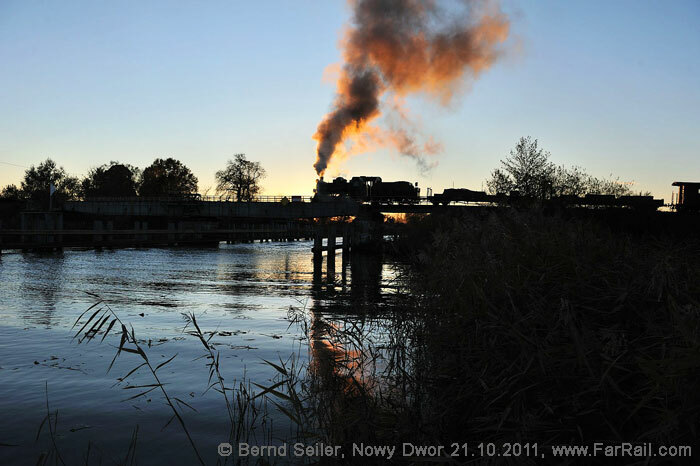 In May 2010 the freshly overhauled locomotive reached Nowy Dwór. Together with some of the remaining freight cars in PKP livery we’ll use this locomotive for our charter train. Authentic passenger coaches are not available any more. We’ll have a freight train and will travel in the guards van. The line is in a generally flat area often following some minor roads. There are several nice photo positions like the swing bridge and the station where the line splits off in two branches in Stegna Gdańska (Steegen). The tour is designed for the demanding photographer and video film maker, for the lover of authentic narrow gauge steam trains as well as for those who like to see a regular steam hauled passenger service where locomotives often exceed a speed of 80 km/h. Poland is a basically agricultural country of the European Union. Following a deep recession, the economy is now growing strongly, even during the recent worldwide recession. However, the state of repair of many buildings does not match that in Canada, UK or Germany, for example, and the condition of the roads leaves something to be desired. Traffic may follow different rules from those you are used to. The official language is Polish, and the younger population often has a decent command of English. Older citizens often speak some German. Petty crime such as theft or pickpocketing is no worse than in other European countries. Nevertheless, you would be well advised to keep a close eye on your photo equipment, as always. Our hotels can be considered as very secure. Please be considerate to others when taking pictures since all participants want to bring home high quality shots. To make this tour successful for you, you should bring a tripod. We will take some night shots, so please be prepared. Please note that this trip is not arranged on a full board basis. On a few occasions, depending on train movements, we may not have time for regular meal breaks. Entry into Poland requires a valid ID card for inhabitants of Schengen states, all others need a passport (but for most countries no visa is required). Electricity (220V, 50 Hz) is available in all our hotels, power cuts are very uncommon. You may need an adapter for the sockets (they have a special safety pin in the centre of the socket). Mobile phone coverage is very good, Poland uses normal European standard. Please take care as you will have to pay roaming costs for incoming phone calls as well as outgoing. All narrow gauge lines have only one serviceable steam locomotive. As there is no spare, technical problems may put us in a situation where we can’t offer the proposed steam train. In addition you need to consider that the condition of the railway track is, sometimes, very poor. Derailments may occur. In the worst case the local authorities may close the line for technical reasons such as weak bridges or dangerous track conditions. Hence we can’t guarantee that we’ll see all lines with steam. We’ll use wagons which may not have been moved for many years in some cases except on our previous charter train events. We might have to sort out problems which prevent an early start as planned or the use of a certain type of wagon. Please be prepared that not everything will run as ordered. However, you can be sure that we’ll get a decent amount of good shots even if one railway fails to deliver. We’ll chase the passenger trains around Wolsztyn using speedy minibuses. However, we need to take care of the traffic rules and consider the sometimes very dense traffic on the roads. You should not expect more than two line shots per train although we might be able to get four. We rate a decent photo/video position higher than getting another shot at a rather boring level crossing. Train chasing doesn’t mean we’ll throw safety overboard or only count the number of shots of the train, we want to make a few quality pictures. Please bear in mind that transportation in Poland may fall short of EU and North American safety standards. Always use common sense when crossing roads and railway tracks. FarRail Tours cannot be held responsible and will not accept any liability whatsoever in the case of any accident, damage or delay. We suggest you take out a comprehensive overseas accident and health insurance policy. As a service to our UK-based clients FarRail Tours accepts and will continue to accept payments made out in Pounds Sterling until further notice. However, please note that all prices quoted in Pounds Sterling are indicative only and are subject to change without prior notice. This measure was taken by FarRail Tours due to the unprecedented volatility in the international foreign exchange markets and its impact on the valuation of the Pound Sterling versus other major currencies, namely the Euro as FarRail Tours' accounting currency.